In the early hours of December 2, the Senate passed its own tax reform bill. While passage of the bill seemed improbable as recently as last Thursday, Senate Republicans were able to overcome objections within their own caucus with last minute tinkering to their tax proposal. Up next is the reconciliation process during which House and Senate Republicans will iron out differences between their respective tax reform bills. At this point, passage and enactment of a reconciled tax reform bill appears to be highly likely prior to year-end. Under the Senate bill, changes to the Internal Revenue Code (“Code”) would be effective for tax years beginning after 2017, except for the change in the corporate income tax rate would first become effective in 2019. Under the House tax proposal, this change would first become effective in 2018 (i.e., a year earlier). The Senate bill maintains the revisions to Code Section 162(m) that were included in the proposed version of the bill. This includes: (i) the elimination of the exception to the $1 million deduction cap for performance-based compensation, thereby making non-deductible all annual pay to a “covered employee”1 in excess of $1 million; and (ii) the expansion of the definition of covered employee to include the chief financial officer. In addition, the Senate bill provides that once an individual qualifies as a covered employee, the $1 million deduction cap would apply to that person for so long as the individual is paid compensation. These revisions to Code Section 162(m) mirror the changes set forth in the House tax reform bill. The Senate (but not the House) bill also includes comprehensive and complex transition rules for the revisions to Code Section 162(m). We believe that the Senate’s transition rules will survive the reconciliation process. 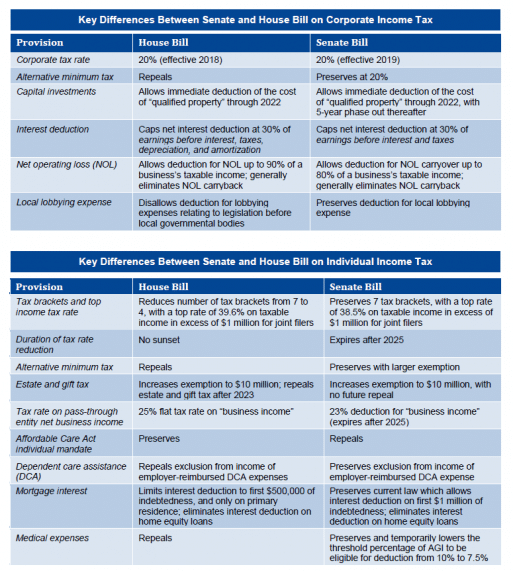 Although broadly similar, the Senate and House tax reform bills contain significant differences that must be reconciled, with the reconciled bill subject to a Senate and House vote. Passage of a reconciled bill prior to the start of Christmas appears to be a good bet. 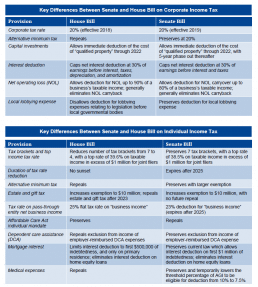 Key differences between the Senate and House bills include the effective date of corporate tax rate reduction (as noted above), the number of individual income tax brackets, individual tax rates and the tax treatment of pass-through entities. However, none of the differences are likely to prevent the passage of a reconciled tax reform bill. 1 Under current law, covered employee refers to a public corporation’s principal executive officer and the three-highest paid proxy-disclosed executive officers (other than the principal executive officer and principal financial officer). The Client Update is prepared by Meridian Compensation Partners’ Technical Team led by Donald Kalfen. 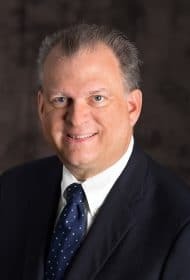 Questions regarding this Client Update or executive compensation technical issues may be directed to Donald Kalfen at 847-235-3605 or dkalfen@meridiancp.com. 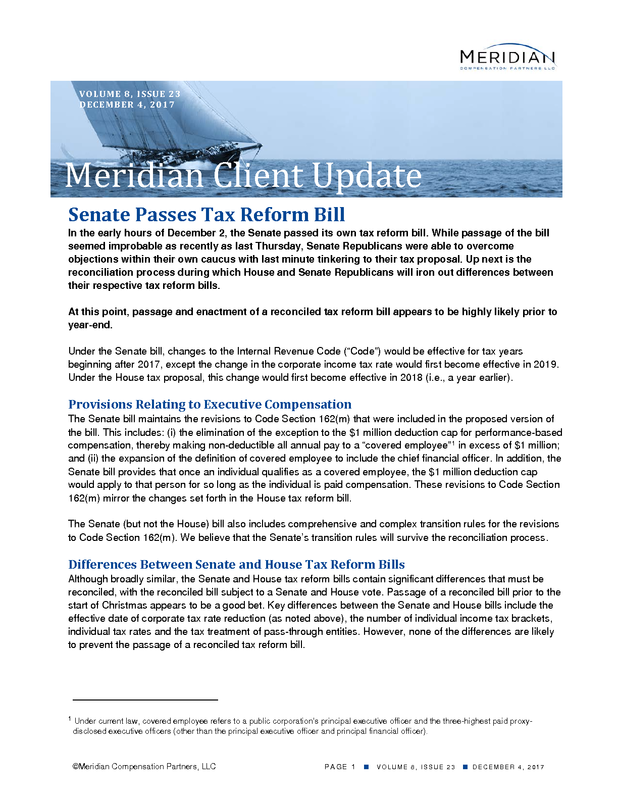 This report is a publication of Meridian Compensation Partners, LLC, provides general information for reference purposes only, and should not be construed as legal or accounting advice or a legal or accounting opinion on any specific fact or circumstances. The information provided herein should be reviewed with appropriate advisors concerning your own situation and issues.